Anniversaries can be occasions of both joy and sorrow. 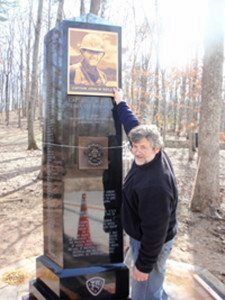 On March 2, 2012, 112 Vietnam Veterans came together at the Marine Museum in Quantico, Virginia for an anniversary that was both. They chose that day to honor their captain, the late Colonel John Ripley with a monument, because it was on that exact day, forty-five years ago, that they endured a ferocious battle where many others lost their lives. It was a sorrowful anniversary because their “skipper” 1 was not there with them. A joyful one because he received the honor he so richly deserved. Designer of the monument, William Duffy, holding a picture of Colonel John Ripley over the place where a bronze photo of the late hero will be placed. The monument is a pentagonal shape to create the idea of a K-Bar knife used by Marines in battle. was the MC for the day’s events. This was “our way to honor our skipper.” He then explained the significance of the day they chose for the dedication and reflected on the March 2 battle which pitted 215 Marines against 1500 Communist North Vietnamese. “The odds were great,” Mr. Goggin recalled, with a touch of bravado that drew a chuckle from the audience. By the time the dust settled in the hours-long conflict, Lima Company lost 22 men but were ultimately successful in repelling a much superior force. Newspapers back home were as surprised with the final outcome as were the Communist NVA who were routed from the battlefield. One paper carried a front page article about the battle with the title Ripley’s Raiders Rout NVA Force. From that day forward, Lima Company continued to use it. The name stuck and a legend was born. That legend lives on in the living Raiders who wore red hats on the day of the dedication, distinguishing them from other visitors to the museum. I had the chance to speak with many of them about their late captain, John Ripley and what he meant to them. Leo Geysa succinctly described his former captain as the “the heart and soul of the unit,” and explained how they knew him both in war as their commanding officer and as a civilian and took time to explain the difference. Glenn Johnson, from Rochester New York, echoed the same sentiments. He did not actually serve with Ripley’s Raiders but fought with Colonel Ripley before the unit was formed. Nevertheless he felt obliged to make the trip to Quantico for the monument unveiling. Mr. Johnson expressed his amazement at the “ridiculously small number of men – only 98,” Colonel Ripley lost during the year when the Raiders were in the bush almost constantly. The words which best described the man he got to know after Vietnam were love and friendship for the men with whom he served. George Webb is from Middletown, Delaware and described the intensity of the struggle days after the March 2 battle. During one skirmish with the enemy he was badly wounded and had to be evacuated. When asked what value or principle Colonel Ripley most embodied he did not hesitate, “God. I would have followed him to hell,” he concluded. 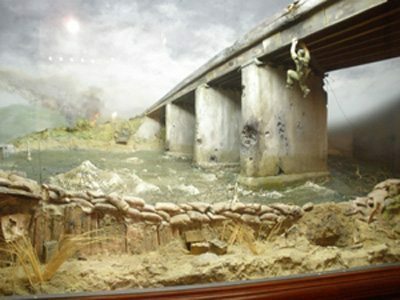 The diorama inside Bancroft Hall of the United States Naval Academy which depicts Colonel Ripley dangling below the Dong Ha Bridge. Bancroft Hall of the United States Naval Academy which depicts Colonel Ripley dangling below the Dong Ha Bridge with two satchels of plastic explosives. 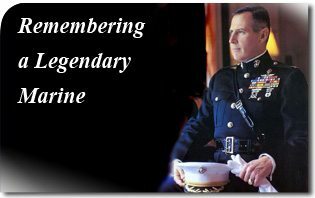 By destroying the bridge he halted the largest communist offensive of the entire Vietnam War and earned the Navy Cross; our nation’s second highest award for valor. Mr. Galanti began by saying that Colonel Ripley was “the greatest man ever to wear the uniform of the United States of America.” As he continued, a Ripley Raider standing in front of me began to wipe away tears as he recalled the memory of his beloved captain. A gentle rain began to fall which led another Raider to poetically comment how the heavens were weeping also. Paul Galanti finished his words with a stirring affirmation. He was convinced that, had the North Vietnamese been able to cross the Dong Ha Bridge they would have continued their march south and ultimately crushed Saigon. Marines come and go but some leave a greater mark than others. Now, thanks to the efforts of Ripley’s Raiders the legend of Colonel John Ripley will, as Leo Geysa said so well, echo into Marine eternity. A term for Captain used by Marines. Force Recon is one of the United States Marine Corps’s special operations “capable” forces. Col. Ripley earned an in-house distinction among this elite group as a “Quad Body” because he had completed four of the most grueling special forces programs in the world. This entry was posted in Fighting the Culture War and tagged Chuck Goggin, colonel, corps, courage, honor, John, K-Bar, leader, legend, life, Marine, Memorial, monument, museum, NVA, Quantico, Raiders, Ripley, Ripley Raider, valor, Virginia, War, William Duffy by Norman Fulkerson. Bookmark the permalink.